This year I bought the Snow & Graham write on calendar for me and the roomies to use. The images for each month are so beautiful and the little squares on the bottom half will hopefully enable us to keep up with each others schedules. ...but this one has me totally rethinking that choice! 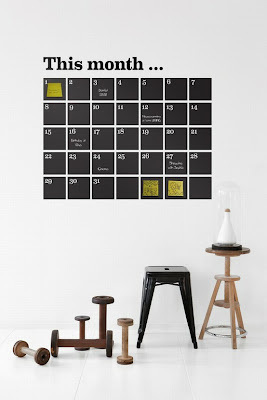 Using chalkboard paint to make a calendar on your wall. Such a cool idea. I love the chalk board wall. Another less permanent idea is to paint the calendar on large wooden structure that could be hung on the wall and moved around. Hey! Hmm let's discuss the large looming calendar in the living room :) May be too much of a reminder of all we have to do! PS I like the calendar you got!